Pyrrolysine (Pyl or O) is a rare amino acid present in some enzymes. 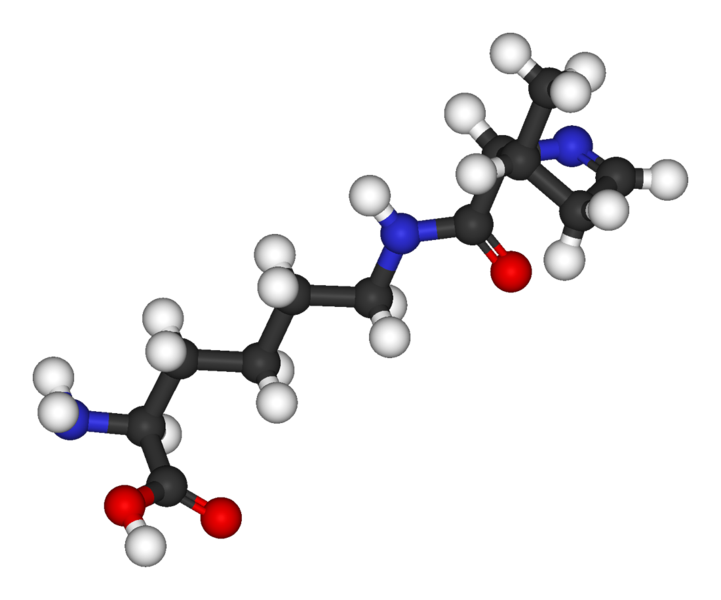 It is considered to be the 22nd genetically coded amino acid. Like all of the amino acids, pyrrolysine is formed from the COOH group and the NH2group which are involved in peptide bonds. It has a very complex side chain which in particular includes a pyrrole ring. Pyrrolysine is bound to a specific transfer RNA whose anticodon pairs with the messenger RNA UAG codon. This codon is usually a stop codon which causes arrest in protein synthesis when it is read by the ribosome. Like selenocysteine, a specific mechanism incorporates pyrrolysine in place of the stop codon.